The acorns I made last week made a big impression on Kade's teacher. (He just had to show it off when he took one for lunch.) She called me last Friday and asked if I could come in and make them with the class. I told her I was happy to. I had thought of taking a picture of little hands making the treats but it went so quickly and I had to be aware of what was going on so I never made the time to take a picture. But as Kade and I were leaving school I saw something I couldn't pass up. The weather had been gray and rainy in the morning but after lunch it started clearing up. 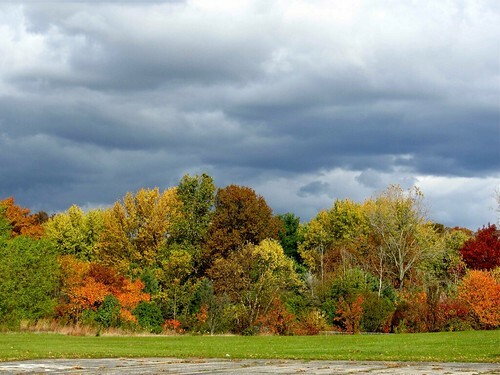 These clouds were still dark and I thought they made an interesting backdrop for the Autumn colored trees. YUM! Thank you Kade and Kelly. My treat was delicious! Did you get a picture of the rainbow this morning? It was amazing from our playground! I missed the rainbow. Darn. I shouldn't have gone back to bed.